Husband and I spent the first three months of married life on an air mattress as the mattress in our rental was too disgusting to use. We moved again and spent 9 months on a Murphy bed (folds into the wall) as our bedroom was multifunctional (living room, TV room, ballroom,...). We recently moved to a place where our bedroom is truly a bedroom and bought our own mattress. Still lacking storage space though, we knew we needed a bed with room for all of my treasures (husband calls it junk...). 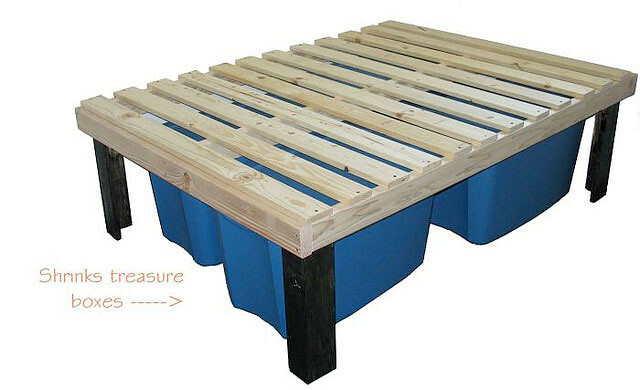 With that in mind, I did my research and found some inspiration for easy to build and cheap to make beds with storage capabilities. Come explore with me the making of our hidden treasures bed! When we went to Ikea to get the rest of our furniture we considered buying one of their frames, but as you know, they are practically on the ground leaving no storage space. We saw their bed slats and considered buying that, but husband insisted we could make something for cheaper as the bed slat design is simple. Plus I remember the downside of Ikea bed slats growing up, their bed slats CONSTANTLY fall through and you end up with a mattress on the floor (really the mattress fell on my collection of childhood treasures, which is even more tragic). As husband predicted though this bed was inexpensive to make and surprisingly quite simple! We bought the cheapest wood at the store, but if you'd like a nicer wood, feel free, just make sure the wood isn't warped so that they're straight pieces. •Measure the 12 A's to 50 inches long and cut them. The long pieces are your slats, eight of the short pieces (22 inches) are your legs. •Measure the 3 B's to 72 inches long and cut them. The long pieces are your lengthwise supports. •Measure the 1 C to 50 inches long and cut. Measure the cut half (68 inches) to 50 inches long and cut. These pieces are your width-wise supports. •Build the box using your 3 B's and 2 C's. •C is the length of the bed, so we screwed our B's to the inside of C.
•Screw the pieces in pairs, making a 90 degree angle (so from the outside it will looks like a solid wood leg). 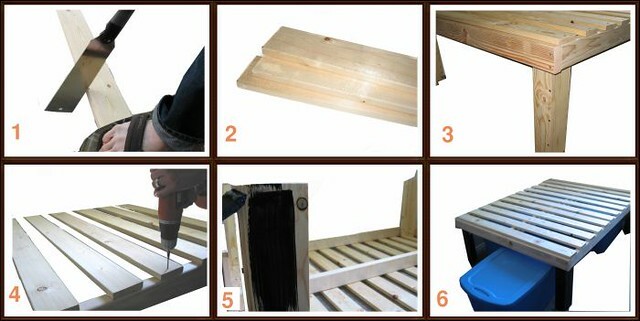 •Screw each of the four 90 degree pieces to the four corners on the inside of the bed frame. You do this making the upper piece flush with the top of the frame (you lose two-three inches in the inside of the frame). As you can see, our pictures show the bed slats being on as we put on the legs. This is because we initially used a different leg (with scraps from other projects) because I insisted the 18 inches of clearance (which is what we ended up with when trimming and screwing) wasn't enough room for my treasures. I'll tell you though, it is plenty of room unless you want to pole vault into your bed every night. •We then flipped the bed over and painted the legs black (you could do the whole bed, but it doesn't show) to match our other furniture. •Flip the bed back over and hide your treasures!! You could also easily make a headboard, but our bed sits right under our window, making a frame less desirable so we'll do without for now. Hope you've enjoyed and let me know if you've found other clever ways to hide your treasures! Wow, that's a great idea and adds alot of storage to a room. I'm impressed, girl! Now if only I could convince my hubby that this would be a good idea. He likes a bed as low to the ground as possible, which is not conducive to storing things in small apartments such as ours. Low beds remind me too much of when we were sleeping with just a mattress on the floor....Extremely high beds remind me of living in the dorms. Middle zone=adulthood, although this is not the equivalent of a true adult bed to me. 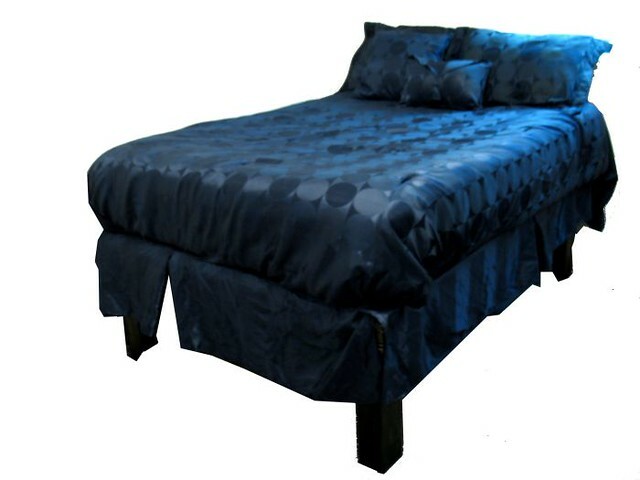 Yes, you can find some classy low to the ground beds, I just like space. Maybe you should just start raising the bed a little bit every week and he'd eventually get used to a high bed!